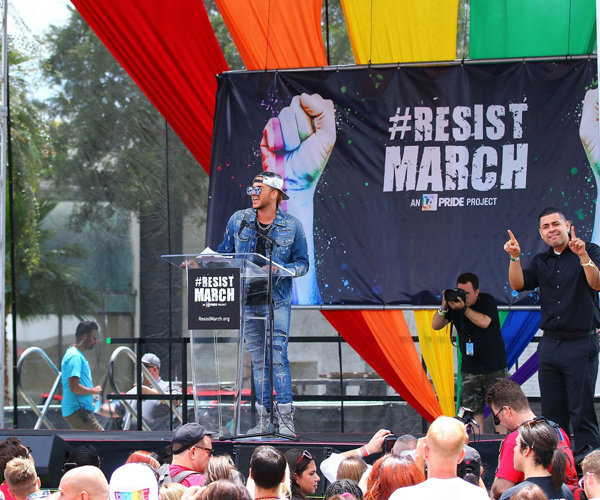 Los Angeles’s Gay Pride Parade became the Resist March yesterday. Tens of thousands of people turned up to protest the many injustices felt by today’s LGBTQ community. Hey, do you think if this singing thing doesn’t work out, Adam has a political future? Kidding!! Here’s the speech again, with 4 minutes of Adam backstage before and after, from LGBT Hollywood. So proud of Adam!!! Awesome speech…. Really proud also. What a great speech! I admit this is the part of him I can’t watch. I’ll wait for the tour with Queen. I’m glad he tried to moderate his speech. It could’ve been way more divisive. So very, very many reasons I love Adam!